More Ford Focus RS details | What Car? Ford has released more details of its high-performance Focus RS, which will be officially unveiled at the British Motor Show on July 22 and go on sale early next year. Ford has confirmed that the RS will be front-wheel drive, powered by a turbocharged 296bhp 2.5-litre engine with 302lb ft of pulling power. Exact performance figures haven't been released, but Ford says it will blast from 0-62mph in under six seconds. The car is also wider than a standard Focus, and has stiffer springs and shock absorbers to improve stability and handling. The steering has also been tuned to give sharper responses, and the traction control system has been refined to allow more spirited driving. The brakes have been uprated, too. Styling changes from the standard Focus include new front and rear panels to incorporate wider wheelarches, and air vents behind the front wheels and in the bonnet. The front and rear bumpers are also different, while twin chrome exhausts and a rear wing emphasise the car's sporting intentions. Inside, the RS has sports seats that are colour-matched to the car's exterior paint. The centre console is finished in carbon-look trim, while the air vents, door handles, switchgear and gearshift surround get a metallic finish. 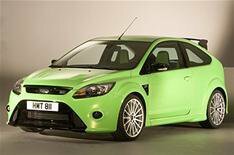 The car that you can see at the British Motor Show will be finished in bright green. However, it won't be production ready, because Ford says development work will continue on the car. No details on the Focus RS's pricing have been announced, but it is expected to cost around 25,000.